I cannot deny that Middle Eastern desserts are some of my favourites. I've never really been a baklawa person, and that's often what first comes to mind when people think of Arabic desserts. But throw me some rosewater and an extra helping of pistachios, and I'm there. 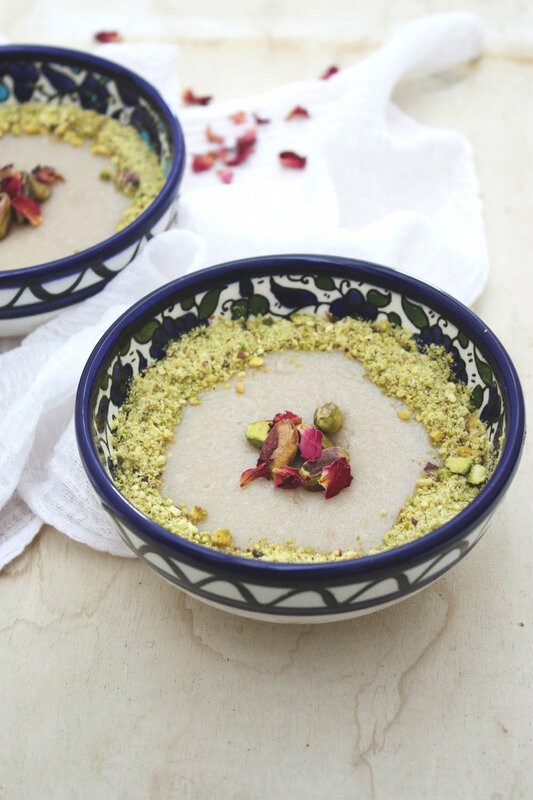 Mahalabiya, a rose water and pistachio milk pudding, is top of my list. I used to make this with my grandmother (bibi) all the time. She used to always make little pots - one for me, one for her, and one extra for whoever was coming over later. Because of that, I'll always prefer having my own little bowl of it rather than scooping some out of a big one, which is how it is more typically served. It helps that my brother brought back some of the most beautiful handmade ceramic bowls from his recent trip to Palestine. I've been wanting to recreate mahalabiya for a while now, and with such pretty bowls at hand, I thought this was the perfect opportunity! Traditionally, the dessert is made with whole milk and caster sugar. However, I thought I'd experiment with making it a little bit more healthy by substituting the normal milk with almond milk, and the sugar with maple syrup. I was pretty nervous as I had my grandma's sister (basically grandma number 2) on the other end of the phone waiting to hear whether my messing around with her recipe had worked or not! Thankfully, it turned out just as I'd hoped. The almond milk makes it feel so much lighter and adds a lovely texture, and the maple syrup adds just the right amount of sweetness. Gluten free, dairy free, refined sugar free, and delicious! It's actually also probably the easiest, quickest, and least-messy dessert I've ever made. You can whip it up in a matter of minutes, and just need a little bit of patience whilst waiting for it to set. 1. Pour the 1/2 cup almond milk and the maple syrup into a saucepan and warm over a medium heat. 2. Meanwhile, place the cornflour in a mug and add the extra 1/4 almond milk. Working quickly, mix these together with a spoon to form a paste. 3. Take the milk and syrup mixture off the heat, and add in the cornflour paste. Stir, and bring back onto the heat. 4. Continue stirring until the cornflour has completely dissolved and the mixture thickens to the consistency of cake batter. Do not allow the mixture to boil! 5. Divide the mixture into small bowls, and leave to cool completely. 6. Transfer the bowls to the fridge, and leave them to set for a few hours, or even overnight. Decorate with ground and whole pistachios, and some edible rose petals if you have any!